This is final year project on "visual cryptographic steganography in images" which is a new technique to hide information within image file for Computer science engineering. In today’s information age, information sharing and transfer has increased exponentially. The threat of an intruder accessing secret information has been an ever existing concern for the data communication experts. Cryptography and steganography are the most widely used techniques to overcome this threat. You can also Subscribe to FINAL YEAR PROJECT'S by Email for more such projects and seminar. 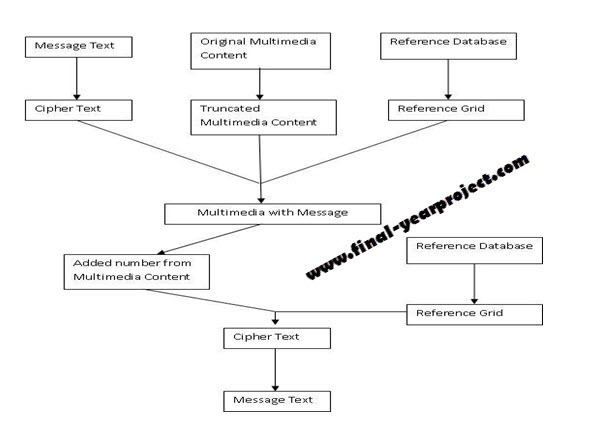 In this project we implement an advanced system of encrypting data that combines the features of cryptography, steganography along with multimedia data hiding. This system will be more secure than any other these techniques alone and also as compared to steganography and cryptography combined systems. Report also include code of the project. Use this project only for your reference and study only. Please check the download link.